As interest in portrait miniature painting was waning in the 1840s with the rapid ascendancy of the daguerreotype, there emerged in Boston an artist of uncommon talent who produced a remarkable and distinctive group of children's portraits. That these watercolors on ivory still retain their delicate intensity and ethereal magic for modern viewers is a tribute to the skill of Mrs. Moses B. Russell, whose work is still largely unidentified or, worse, mis-attributed to either her husband or the itinerant portraitist Joseph Whiting Stock (1815--1855). Although Mrs. Russell rarely signed her pieces, the distinguishing characteristics of her work make it readily possible to identify her hand. Though she was well -known as a miniature painter of considerable reputation, her early years and artistic training remain a mystery. She was born Clarissa Peters in February 1809 in the Massachusetts town now known as North Andover, situated twenty-four miles north of Boston. She was the fifth of twelve children born to Elizabeth Farrington Davis and John Peters. The Peters family had been prominent in local affairs for generations, and her father served as chairman of the board of selectmen. Clarissa most likely attended Franklin Academy, the first incorporated institution in Massachusetts to admit young ladies and the same school her younger sister Emily attended from 1836 to 1838. By 1835 Clarissa Peters was in Boston not only painting miniatures but giving private instruction in the art as well. It is believed that Peters learned her profession from Moses B. Russell. Where and when they first met is unknown, but their careers as fellow miniaturists were intertwined. In 1839 Clarissa Peters was married to Moses Baker Russell (1809-1884) in Providence, Rhode Island. They had one son, Albert Cuyp Russell (1839-1917), who became a wood engraver. Mrs. Russell's active participation in local exhibitions, which also included the Boston Athenaeum (1842, 1843, and 1844) and the Boston Artists Association (1842 and 1843), made her known to potential customers and obviated the need for paid advertisements. From 1840 to 1851 she shared a studio with her husband at 21 School Street in Boston. Mrs. Russell's work has often been confused with that of her husband, which is not surprising, given his tutelage, their exhibitions at the same locations, their occasional joint exhibitions of works under his name only, and the fact that the backing papers on a few of her pieces are inscribed simply "M.B. Russell." Although his influence shows in her work, his work is easily distinguishable from hers on the basis of palette, execution, formality, and subject matter. His infrequent renderings of children have a certain solemnity and lack the sympathy and vibrancy of hers. 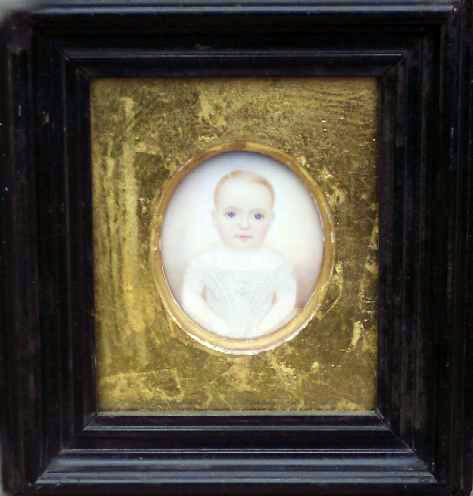 Given the number of examples that have survived, it is apparent that Mrs. Russell clearly developed a specialty in children's portrait miniatures. She was also skilled in her renderings of adults, but it is her depictions of childhood that captivate and charm--timeless tributes to innocence from an age that revered and celebrated the child. The oversized limpid blue eyes of the sitter, the frontal pose of the head and shoulders, and the sitter's placement close to the picture plane create a sense of immediacy that fully engages and holds the viewer. Many of the characteristics we associate with Mrs. Russell's work are present in this portrait. These include the background, here a blend of brown, blue, and yellow that creates an eggshell-like color, although Mrs. Russell also favored gray green, and purple backgrounds. The skylike opening gives the work an atmospheric effect and creates the illusion of depth, counterbalancing the flat features of the subject. The eyelids and irises are heavily outlined, making the eyes the most prominent facial feature. The child exudes a sense of animation and good health, with pink cheeks and an intense gaze. The overlarge eyes create an emotional connection between subject and viewer, as is the case in many of Mrs. Russell's portraits. Clarissa Peters Russell painted miniatures in Boston between 1836 and 1854. A highly productive artist, her portraits have often been mis-attributed because she occasionally worked with her husband, also a miniaturist, and often signed his name to her works, perhaps in the interest of developing the family business rather than an independent career. The artist developed a particular expertise and a devoted following for her likenesses of women and children. It is framed in a molded ebonized frame with old bubbly glass. Size is 5-1/2" x 5" framed and the oval is 1-2/3" x 2" (sight). Condition is excellent.